What’s the worst thing about being seven minutes younger than your sister Gabby? Gabby thinks that since she is older, she always gets to ride in the front seat of the car. Growing up, I played every sport offered. When I got to grade 6 I decided that it would be fun to join the track and field team at my school. I never really started taking it seriously until about grade 8 when I was approached by my long time coach Jake Borden to start training over the summer to try to make team Nova Scotia / Nunavut to attend the Legion National Championships in Sainte-Thérèse, Quebec. In the past you’ve described your sister Denver, who also competes in the long and triple jump events, as your biggest competitor. Tell us about the competitive relationship between you and your sister. What do you enjoy most about this sisterly rivalry? What I enjoy most about our sibling rivalry is that we push each other to be the best we can be. I believe that I would not be where I am now without her. We are each other’s number one support system, and give each other advice on what to work on for the next jump, to help one another gain a few centimeters on our jumps. It’s always a good feeling to see Gabby do well. I believe that coming from a multi-sport background was very influential to the success of my track career. I believe that playing sports such as hockey really helped me develop the strength and power needed in order to have an explosive take off in the horizontal jumps. I also believe that being a multi-sport athlete has helped me be faster on the runway during the approach, which overall has helped me jump further. 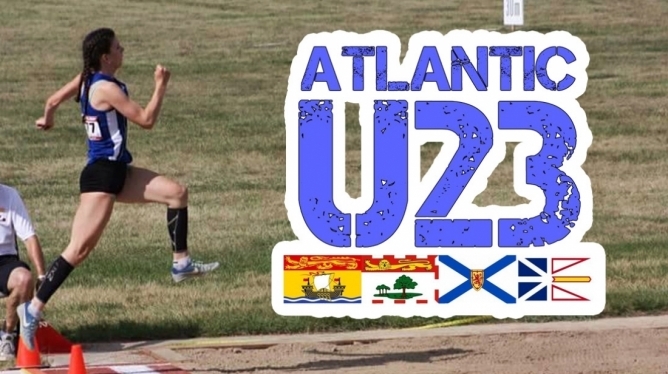 During your years competing for Team Nova Scotia/Nunavutat the Canadian Legion Track & Field Championships, you had numerous strong showings, including 6th place finishes in the long jump in 2016, and in the triple jump in 2017. Take us through your years in the Legion program. What were some of the ups and downs? Overall, my experiences at the Canadian Legion Championships over three years representing Nova Scotia was something that I will remember forever. Whether it be through watching amazing athletes compete or making best friends from all across the country that I’ll have for a lifetime, it was truly a great experience. One of the downs of my experiences at nationals was that in 2017, when on the day of my long jump competition I had felt amazing and was jumping much further than I ever have before; however, I had faulted all of my jumps in the qualification round. That was definitely a learning experience for me that I continue to work on to this day. It is always a great honor to wear the blue, white and gold and represent your province at a national championships. Making the 2017 Canada Summer Games team was an amazing feeling, especially doing it with my best friend/sister by my side. We were both really excited to have the opportunity to compete against the best athletes in the country as well as take the chance to be a spectator and cheer on all of the other sports teams representing Nova Scotia. Hopefully in the future we will continue this streak as we try to make other teams, such as Team Canada. At the 2017 Canada Games, you had a less than ideal result with three faults in the qualifying round of long jump. Take us through your Canada Games experience. What went wrong during the competition? I was not very happy with my performance at the 2017 Canada Games. Leading up to the Games, I was just recovering from a hip flexor injury, and therefore felt not as prepared as I wanted to be. Despite injury, I was happy with my jumps; however, my approach was slightly off, which is frustrating. I also believe that I let the nerves get to me as I was competing against athletes that were much older than I was. Track and field is sport that relies on your mental strength just as much as your physical strength. This is something that I have been working on a lot, especially since I am now competing at the Division I level, and will continue to work on leading up to the next Canada Summer Games. For the next edition of the Games in 2021, my goal is to be more confident in myself and to be a stronger athlete, mentally and physically. I believe that at the University of Nevada, I will be able to gain more experience in the sport of track and increase my jump to over six meters in the long jump, and be amongst the top three in Canada. At the University of Nevada, there is way more opportunities for me than staying and competing in Canada. Some of the contributing factors that influenced my decision to attend the university is that the campus is very beautiful and the track and field program is very good. Also, the university really focuses on making sure their athletes receive a good education. Studying kinesiology and competing for the university’s track and field team can make for a busy schedule. Take us through a typical day in the life of training as a member of the Wolf Pack? My day starts off with classes all morning, followed by practice where we usually practice for about two hours. We then have a weight session following practice. Following weights, I try to have something to eat and then head to the academic center where I do all of my homework for the day. Ever since I began playing sports, I have always dreamt of competing at a Division I school for any sport. As I was growing up, I remember my mom telling me about all of the amazing opportunities I could receive by competing at a school in the United States. In the NCAA, I feel as though the competition is a lot stronger than in U SPORTS. Also, I really like to compete outdoors and there is no outdoor season for U SPORTS, so that is definitely one of the advantages of competing in the NCAA. Another advantage is there are way more opportunities to succeed in the sport of track and field, as schools in the NCAA, such as the University of Nevada, attend more meets, have better facilities, and really help athletes succeed in not only their sport but in their academics as well. Due to your participation in multiple sports, you’ve only competed indoors a couple of times in your career. How has this been an adjustment now that you’re training and competing indoors in the NCAA? Training and competing indoors is definitely something new to me. I really like it, however it definitely has a different atmosphere than outdoors in the way that the crowd is much closer, and much louder, to you. I believe that I am adjusting well to indoors and I am excited to see how this season will go. My goals for this season indoor season is to score at the Mountain West Conference Championship, and to work on building confidence on the runway as a new colligate athlete. I also hope to land a spot on the University of Nevada all-time top-ten indoor list for the long jump (1st, 6.00m – 10th, 5.72m). My goals for this outdoor season is too get a lot faster and be within the top three on the University of Nevada all-time top-ten indoor list (1st, 6.15m – 3rd, 6.01m – 10th, 5.82m). I hope to jump over six meters in long jump and improve my technique in the triple jump to become more comfortable in the event. I will always need to continue to work on confidence and will pay a lot of attention to controlling my mental state during competition in order to compete to the best of my ability. Other hobbies include playing hockey and watching television.